Erythema is a skin condition that results in skin redness or rash. Some of the most prevalent types of erythema include UV-induced erythema, erythema nodusum, photosensitivity, and erythema multiforme. UV-induced erythema is sunburn: when an individual develops a burn from ultraviolet radiation resulting in irritation of the skin, redness and inflammation. The is by far the most common type of erythema. Erythema nodusum is skin inflammation that tends to center around the fatty layers of the skin and is characterized by painful lumps usually on the front of the legs. Photosensitivity from medication is when an individual is taking medication or has some type of infection that creates sensitivity to the sun and UV rays and results in redness or rash. Erythema multiforme is caused by various medications, illness, or infection and is characterized by lesions or raised red spots on the skin. There are many other less-common types of erythema as well. Other types of erythema include: Erythema chronicum migrans, Erythema infectiosum (also known as fifth disease), Erythema toxicum, Erythema ab igne, Erythema induratum, Erythema elevatum diutinum, Palmar erythema, Erythema gyratum repens, and Keratolytic winter erythema. The most acute forms of erythema multiforme are SJS and TEN (Stevens-Johnsons Syndrome and toxic epidermal necrolysis respectively). Symptoms of SJS include target lesions on the lower half of the body plus fever, cough, and blisters that appear around the nostrils, mouth, eyes, and groin area. Symptoms of TEN are the same as SJS but continue into skin peeling and detachment, infection, loss of fluids and sometimes death. Anyone of any age who spends a lot of time in the sun is at risk of developing erythema–especially UV-induced erythema. Men tend to develop erythema multiforme more frequently than women do, and women are at a higher risk of developing erythema nodosum than men are. People between the ages of 20 and 30 are also at a higher risk of developing erythema nodosum. All forms of erythema are at a greater risk of developing if an individual has a family history of the disease. Defend Your Skin Naturally. Healthy Anti-Aging Protection In A Capsule. Basically, anything that causes the surface capillaries of the skin to dilate can result in some type of erythema. Most of the time, a physical exam by your doctor is enough to diagnose erythema. It can be distinguished from bleeding inside the skin as well as other types of pigmentation issues because erythema disappears with finger pressure while the others do not. The heat of your skin does not normally go up from erythema unless the condition stems from arteries in deeper skin layers. The nodules or red patches are usually firm and raised, and depending on the age of the lesions they may have a bruise-like appearance. Your physician may also order a throat culture, blood test, skin biopsy, or x-ray. These tests will reveal medications or infections that may be contributing to or causing your symptoms. Over the counter medications that ease the inflammation and cool your skin can be used such as corticosteroid cream or aloe vera gel. Moisturizers, ice packs (wrapped in a damp cloth) and staying hydrated will help treat the burn after the fact. But the best treatment is preventing sun damage before it happens. Initially erythema nodosum is treated by managing the underlying condition that is suspected of causing the issue. The inflamed area of your skin is targeted for treatment and may include corticosteroids by local injection or mouth, anti-inflammatory drugs, or colchicine. Treating erythema multiforme includes the use of topical steroids, analgesics, oral antihistamines, localized skin care, and various soothing mouthwashes. For intense cases, wound care and astringents can be used directly. Again, if it is suspected that a prescription drug is causing the issue, it may need to be discontinued (with your physician’s consent). If solar or UV radiation is suspected of causing your erythema, certain steps must be taken to prevent future cases of erythema including staying out of the sun (at least during peak solar radiation hours in the middle of the day), wearing a hat and protective clothing, and using sunscreen lotion. Prevention lies in what ultimately causes your erythema. If you are sensitive to the sun and too much exposure causes erythema, then you need to avoid sun exposure. You should also consider using sunscreen lotion and wearing protective clothing while in the sun. If medications are suspected, then alternatives should be explored as well as varying dosages or discontinuing the medication altogether. Good hygiene and good nutrition is recommended for maximum immune health and preventing possible secondary infections. Sun exposure damages and ages your skin. Excess sun exposure over time and repeated sunburns also significantly increase your risk of developing skin cancer. By taking active steps to decrease your sun exposure and prevent damage while you are in the sun, you can both decrease the appearance of aging to your skin and decrease your risk of future sun-related skin complications. Once you start treatment for erythema multiforme, you generally see it disappear after 4-6 weeks. This more severe form of erythema usually disappears within a month; however, if not treated, SJS can lead to blindness and/or death. TEN can cause death if not treated properly. Quickly identifying the medication that is causing the TEN or SJS greatly increases the chance for survival. Doctors generally monitor the individual’s electrolyte levels, fluid levels, and possible protein loss and organ damage in the body. Sometimes, hospitalization is required. Erythema is a skin condition that is caused by a number of factors including UV rays (solar radiation), prescription medication, pregnancy, birth control pills, bowel diseases like colitis and Crohn’s disease, strep throat, fungal diseases, cat scratch fever, and more. There are many types of erythema; the most common among them are UV-induced erythema (sunburn), photosensitivity from medication, erythema multiforme, and erythema nodosum. Symptoms of erythema vary based on the type. Symptoms generally include outbreak of lesions or spots, bumps, etc. on palms, hands, feet, and knees (or in the case of erythema nodosum, on the trunk area and thighs, shins, and sometimes forearms). Individuals may experience flu-like symptoms including fatigue, fever, joint pain, and arthritis pain. In the case of erythema infectiosum, a rash develops on the face and arms. UV-induced erythema results in a sunburn (inflammation, redness, irritation, and peeling of the skin). Anyone who spends time in the sun is at risk of developing UV-induced erythema (sunburn). And anyone who is UV-sensitive is at risk of developing erythema photosensitivity. Those most at risk for developing other types of erythema include people between 20 and 30 years old and those with a family history of the disease. Men develop erythema multiforme more often than women, and women develop erythema nodosum more often than men. Causes of erythema include overexposure to UV radiation, pregnancy, birth control pills, various fungal and bacterial diseases, inflammatory diseases such as Crohn’s disease, and prescription medications, among others. Usually, physicians can easily diagnose erythema by its tell-tale target or bull’s eye rash. There is no excessive heat associated with the bumps and lesions, and redness disappears upon applying pressure to the skin with a finger. However, if a physician isn’t certain, a biopsy may be performed, along with blood tests, x-rays, and throat cultures. Treating erythema involves various anti-inflammatory drugs or corticosteroids taken by mouth or local injection. Other drug therapies may include NSAIDs, antiobiotics, antihistamines, photomodulation therapy, and Burrow’s compresses. Treatment may also involve the cessation of any and all medications that are causing the erythema. Good nutrition is also recommended (as it always is!) in addition to the above treatments and may include eating healthy and taking vitamin and mineral supplements. Preventing erythema includes proper treatment of underlying diseases that are caused by medications, limiting exposure to the sun, proper immune system support, and good hygiene to prevent secondary infection. 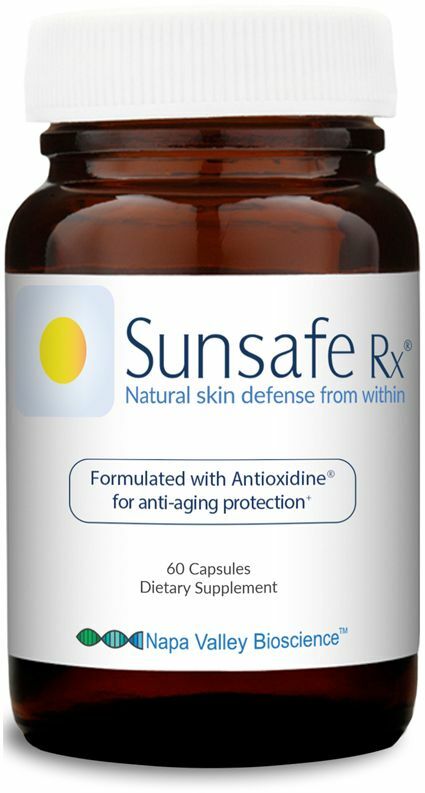 The Sunsafe Rx capsule, taken orally, may also help protect your skin and eyes because research shows the natural ingredients promote your defenses against the effects of environmental stresses.